Purchase your 2019 User Permit today! The 2019 User Permits are valid from 11/13/2018 – 12/31/2019. Permit Gift Certificates are available! HMT Permits make the perfect gift for your favorite rider! To order a Gift Certificate, call 1-800-592-2217. 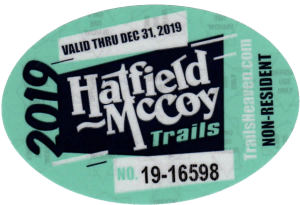 Each person visiting the Hatfield-McCoy Trail System, including passengers, is required to purchase an individual User Permit. This Permit allows you to ride, in accordance with our rules, on hundreds of miles of private land that make up our seven trails: Bearwallow, Buffalo Mountain, Devil Anse, Indian Ridge, Pinnacle Creek, Pocahontas and Rockhouse. User Permits must be displayed on the users helmet at all times while on the trails. Call today to ask about our Military Discount! 1-800-592-2217. Misplaced, lost, stolen or unused permits are NOT refundable. 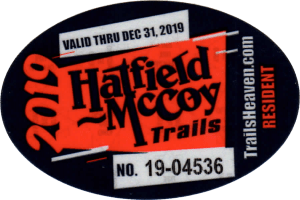 We do not require you to have a title or insurance on your machine to ride the Hatfield McCoy Trails. All permits are valid from the date of purchase until December 31st of that year. Be sure to read our Trail Rules and Regulations before buying a permit. Before purchasing, be advised that no one under the age of 6 is permitted on the trails at any time. On our Web Site: You will received a Hatfield McCoy Permit in 5 to 7 business days. At our Welcome Center, just off US State Route 119 and 19 miles south of Charleston, WV, between 9:00a.m.-5:00p.m. At the Country Roads Byways Visitor’s Center near Logan, WV on Route 73, between 9:00a.m.-5:00p.m. At one of the following staffed Trailheads, between 9:00a.m.-2:00p.m. At one of over 100 authorized retail locations in the area. IMPORTANT: $4.00 shipping and handling per permit will be added at checkout. All permits are sent via USPS Certified Mail and cannot be delivered without a signature. If no one is home when delivery is attempted, you may have to pick up your permit in person at your local post office. *West Virginia Residency is determined by state-issued identification for all individuals 16 years of age or older. ID must be presented at the time of purchase. **If ordered online, a $4.00 shipping and handling fee will be applied. (All permits will be mailed Certified for tracking purposes.) Please allow at least 5-7 business days for delivery.